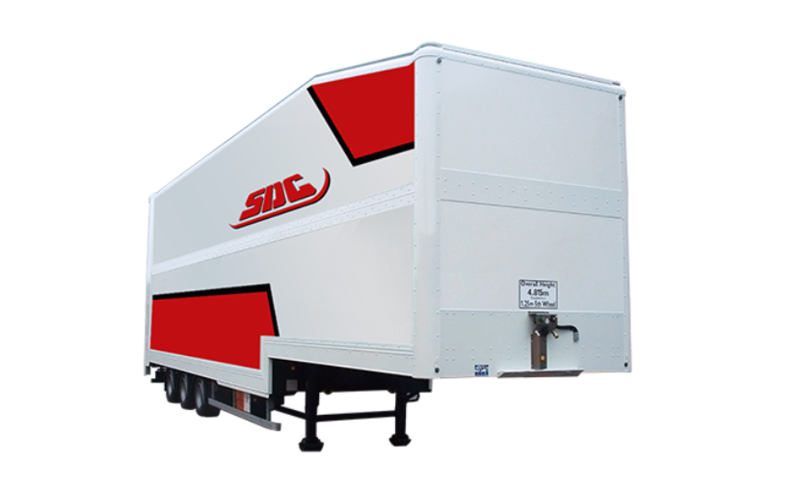 SDC offer a range of Double-deck boxvan trailers to suit customer requirements. These offer a secure, dry and hygienic loading environment for many applications. The double-deck boxvan allows for an increased pallet and / or cage carrying capacity. The internal fit out and load security can be fully customized to the customers’ requirements. Double the footprint of the load carrying capacity. Hygienic load space for your valuable goods. The SDC Double deck Boxvan can carry up to 52 pallets which increases efficiency for the operator and reduces carbon footprint. SDC can customize your overall height and deck splits to suit your requirements. The operator has the flexibility of customizing various load restraint options for their operations. The SDC Double-deck boxvan can be supplied with a tail-lift suitable for loading the upper and lower deck meaning the operator does not necessarily need a bay to load / off-load. The SDC boxvan is available with standard aluminium roof, an insulated roof or a translucent roof depending on the operator needs. Internal security mesh is also available to avoid access through the roof. SDC offer a wide range of floor options including keuring, wisa-trans or hydro-roll floors. Every SDC Trailer is bespoke manufactured to meet the requirements of the operator. Our engineers will develop a trailer specification that maximizes your transport operations. Speak to your local SDC Trailers representative to find out more about our extensive selection of body, chassis, door, floor, roof, load restraint and storage options.